In 2007, I was the only person in humanity to correctly predict (on MLB.com) that Colorado would go on to its first World Series. In 2008, I had the Padres winning it all and they bombed. In 2009, I am planning to spend late October and early November in the Bay Area for a 20th-anniversary reunion. I think Oakland will have a shock-the-world mindset with its no-name pitching staff against a Giants team that is stockpiled with young talent led by the game’s best pitcher and ready for its first-ever title in San Francisco. These are my predictions. Our friend Roberto over at Blogging Dodgers and Baseball asked in the comments: “What happened to my Photo album? No more albums?” This entire project has been an upgrade from the antiquated Typepad 1.0 app and steady upgrades will be added. Among them will be the development of an Asset Gallery. MT currently designates photos, videos and audio files as “assets”, and look for that enhancement in the near future. Speaking of Dodgers blogging, check out original MLBlogger Tommy Lasorda’s post from tonight. Great story about Steve Sax and Kenny Landreaux. Only Tommy can tell it like that! We temporarily changed “Most Recent” to “Most Recent Activity” just to avoid any confusion while the automation of latest blog headlines is being worked on. As you’ve probably noticed, saving any entries, including comments, causes a blog to have its title show up there. So when you see the MLB.com Visitor’s Guide listed often, for example, that means someone on the MLB.com homepage just saw the prominent link to give us feedback about the MLB.com homepage design. That company blog is an MLBlog just like yours, so that comment makes it show up in the “Most Recent Activity” just like you saving a new text post. Soon there will be multiple tabs for Most Recent, Most Popular, etc. But for now, it’s just overall activity. This is what Facebook users are used to seeing on their Dashboard/Home page, so it’s not uncommon, but we obviously want to separate the comments from that. Bottom line is that the “Most Recent Activity” headlines keep changing fast around the clock now, and it’s a good way to get around to other blogs. With more getaround to come. a callback to make these things publish more aggressively. One of the best things I’m seeing is so many bloggers asking and learning about tags. These will become increasingly important going forward with MT — incredibly important. Now is a good time to start always tagging words/phrases relevant to your entry you’re saving, whether it’s a text post or an Asset. When we add Search Tags, you’ll want people to find you that way. If you’re a Yankees blogger, for example, you should always tag “yankees”. Then when someone searches for all “yankees” tags, they can find your entry. people want to scroll to the bottom to find their new comment! Preferences seem to vary from site to site. Please let me know here if you are experiencing any issues with getting from the green Signin link on the MLBlogs.com homepage to the actual signin page. exclude any of those migrated tags. yes, I’d like to see paragraphs back within these comments, too! We’re looking for someone to sing “Take Me Out To The Ball Game” at the All-Star Game this July 15 at Yankee Stadium. If you sing or can perform a version of that song as well as you blog about baseball, then enter your video in the contest by late May and then comment on the Take Me Out To The Blog Game page that just went up here. . . .
On April 1, 2007, I predicted on the MLB.com homepage that the Rockies would be in their first World Series. For full disclosure, I had them beating Texas. My philosophy in this era is pretty simple: The majority predictions will be abject failures, and it will be Shocktober. You know in your heart when you have been making your picks out there that there is no way in hell it is going to be right, but somehow you were taught to use logic in baseball. 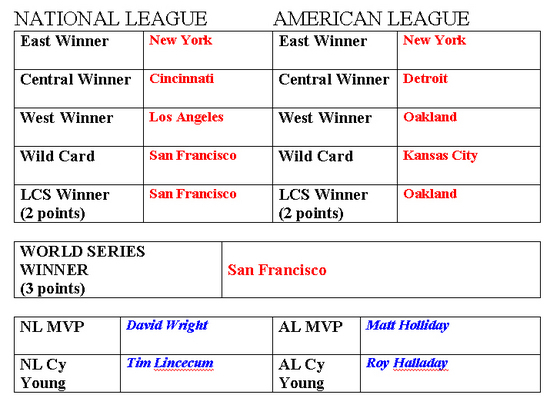 Here we are at the start of another season, and I just wanted to be on record first with my predictions for 2008. I am going with the Padres all the way this year. I feel the same thing about them I did with Colorado last year. I believe it is their time. First of all, let me summarize why I believe it is time for San Diego’s first major sports championship. I am a Bud Black guy. When I was a Giants beat writer for the San Jose Mercury News, I was around Bud every day and he was my go-to guy. He just exuded class to me, intelligence, leadership, and grittiness. That was toward the end of a fine career. I think Bud Black is your next generation’s Tony La Russa or Bobby Cox, and by that I mean a guy who is going to be approaching records for managerial victories. I think he wins his first World Series as a manager in 2008, having won as a pitching coach with the Angels (2002), having won as a player (1985 Royals), and I think he will have a lot of pennants and world championships as a manager in the years ahead. He has the pitching. He knows what to do with it. Jake Peavy, untouchable. (And yes, it was before Peavy’s Opening Day dream game that I turned this ballot into our company predictions keeper who does this each year.) Chris Young — my predicted Cy Young winner. Horribly bad-luck second half last year, should have been an 18-game winner, will go 22-5 in 2008. Mark Prior, you’re back and in the right place around Black. Greg Maddux at the back of your rotation. (Ex-Cub factor everywhere, not a great sign.) Heath Bell showed during the pennant race what a terror he is going to be in late innings. Trevor Hoffman is looking good this spring. I look at San Diego’s roster and up and down their pitching — and it is so late October. Jim Edmonds (DL) and Tadahito Iguchi bring the rings. Adrian Gonzalez is going to be the why-not-him All-Star sentimental buzz in a few months. These guys will get back to Shocktober, but it won’t be with old perceptions. NL West and a World Series to SD. I’d feel even stronger about it with a little more sizzle in the Padres’ lineup, but I still believe it is their time. NL East: Mets. NL Central: Brewers. NL West: Padres. NL Wild Card: Braves. AL East: Red Sox. AL Central: Indians. AL West: Mariners. AL Wild Card: Tigers. MVPs: Prince Fielder, David Ortiz. Cy Youngs: Chris Young, Justin Verlander. It’s fun. You can really make a case for almost every team. The past couple of months I’ve thought about the likelihood of a Sendoff Series in New York, I’ve liked the Brewers (easily could win it all), I’ve liked the Angels (something doesn’t feel right now, injuries only part of it), I’ve liked the Indians (CC/FC, out go the lights), etc. I think it’s stupid to pick Boston because 29 teams are standing in the way of repeating, and all but a handful could win the ring. This is why more than 80 million butts will hit seats. That and the fact that we love this game. Yesterday brought back everything to me, thinking about what it felt like to get good wood on the ball and smash homers into cornfields as a teenager in Indiana, how much you hated hearing that the field had too much water after that storm so you’re rained out today, playing whiffleball in the streets in the rain and using ghostrunners and pretending you are the ’70 Twins and Carew is up, teaching your son to chuck those big acorns at Redwoods in SF to learn to throw on his way to becoming a high school All-Stater one day, playing pitch-and-catch and hotbox all the time, scoring a 4-6-3 double play, asking Terry Mulholland to sign your scorebook after his no-hitter, watching Joe Carter’s ’93 homer land right in front of you, being there for Cal’s 2,131st, being there for Big Mac’s 62nd, being there for Michael Jordan’s Spring Training experiment, remembering how mad you were in ’94 and how happy you are now, standing next to Youk and Papelbon on the infield grass last October at Fenway as they did the strut immediately after clinching the pennant, just loving baseball. I still love it and I know you do, too. Who’s going to win it all?